"Learning human language takes time and patience, I for one spoke it since I was a charmander." 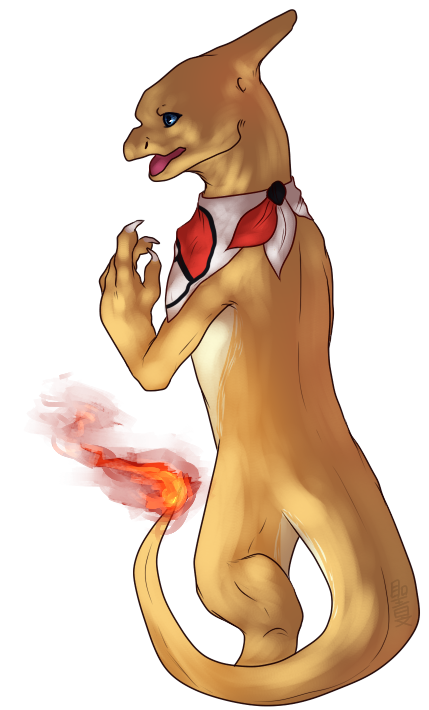 A shiny charmeleon with a bandana around his neck. Despite being able to talk human language Drake is intelligent for that of his line and was taught how to speak his master's language when he was a young child. He's down to earth simple as that. He holds his master's honor in high regards and is willing to help out anyone by any means if it meant his own life. Drake was born into a family of rich people with them owning a Charizard. Once Drake hatched from his egg his coloration was different from a normal charmander. Despite this occurrence, Drake was taken in as a member of the family and given lots of love by them. As three years had passed, the family's son had decided to teach Drake how to talk. Day and night, the boy had put all of his effort into teaching Drake how to talk. Drake was subjected to multiple ways of communication. Either through human speech or listening to the butler teach him when the master and his parents was away. The charmander struggled to say something, but he couldn't since he was still to young. When his master took a break for a bit, he thought maybe teaching Drake nothing but TMs would work. First being hidden power then flamethrower, Toxic and finally protect. After that it was right back to teaching. Though it seemed hopeless at first, but eventually after seven years of trying Drake's master succeeded. Drake finally said his first word. "Hi" The Charmander had began to speak human language. During the time growing up, Drake continued to be taught to speak more. eventually he became fluent in the english language. As he evolved into a charmeleon he was given a bandana to commemorate his success. Drake wasn't done learning yet though. After his master sat down with him. He was being taught how to talk with other humans and helping them whenever they needed. One day both Drake and his master went down to help out with the local school. When the teachers asked Drake's master how he got Drake to help out. Drake's master simply told them to ask Drake themselves. Once they did though, they was surprised what came out of the charmeleon's mouth. It wasn't his poke speech. It was actual human language. "You never heard a Charmeleon talk before?" Since then Drake had helped out when he was needed. When the time came for him to battle his pride however kicks in and goes picking fights with tougher pokemon which ends up with him being on the receiving end of a beating. It is likely that it was wealth that even he possessed through his master. Upon hearing other pokemon talking he was able to translate the language into english helping his master know what is being said. Six years went by as Drake continued to talk with other humans and helping out when needed. At this point Drake was being treated not just as another pokemon, he was treated as a brother to his master. Things went very well for the two as Drake entered his young adult years. During that time Drake began translating from pokemon to human language by talking with his own parents. One day, Drake asked his master where they're going next. The answer however wasn't good. Something had happened and Drake was told to stay with the butler until they returned. Then it happened, the epidemic struck like a plague and Drake was caught right in the middle of it. Waking up from a well deserved rest, Drake went to check with the butler on what can be done. Just as he came into the main hall the Butler told Drake to stay back from the door. "Henry, what's going on?" Then the undead bust through to door and the butler starts shooting the undead telling Drake to get out of there and find the masters. Upon escaping, Drake heard nothing but gunfire as he fled from the mansion. Now, Drake will do whatever it takes to survive and help those along the way human and pokemon alike. But can he set his pride aside and focus on what's important. "We all are connected to the spirits of the land." Maka's a brave Mightyena with the thoughts of being future pack leader. In a fight though he's skilled in taking on most threats. However he'll flee if he's outmatched. Maka was born in the wilds of Kalos. As a child Maka never had much to do other than following his father around as they hunted for food. The poochyena had asked his father once on why they hunt and His father had told him that the connections between them and nature is all around them. The young dark type knew his father was wise and strong, but he had no idea his father was very appreciative of what nature brings. Like most of the pack's pups he was left with his mother as the adults had went onto hunt their biggest prey yet. After waiting for a few hours they all returned with food for the rest of the pack. Maka was happy that his father came back food. It was from up near the Frost Cavern and the food was delicious as usual. Eventually though Maka would have to learn with the other pups to hunt as a pack. That time will come when his father deems him ready for his first hunt. While growing up, Maka had wondered if they ever gone past the cavern before. He asked his father, but his father tried to change the subject. His mother had nudged Maka to go play with the other pups of the pack. Thusly Maka decided to go play with the others. Then came the day of his first hunt as a member of the pack. Maka was much like his father in a way of hunting. He preferred to take the lead of any hunt. Eventually that had given him the recognition of being the future alpha. As he entered his teen years and evolved into a Mightyena, he led hunt after hunt with precession and like so he thanked nature for the successful hunt. His hunting skills continued to increase as time went on and he was well aware of his success. Finally reaching his young adult years he had went with his pack to hunt down the very same prey that his father did. It was a tough fight, but in the end Maka had succeeded and returned home with the prey in maw. His father came to him telling him that he is close to becoming the next alpha of the mightyena pack and in a few months. He would be taking the rite to become the new leader. Little did he know that his life would change forever. A few days before the rite of passage was to start several mightyenas encountered an ill one of the same species. Maka came home after a scouting of the land. He seen everyone of his pack was unusually ill. 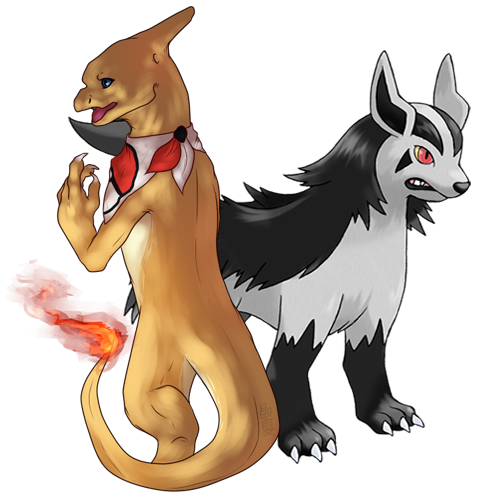 The dark type rushed home to find his parents gravely ill. His father had told him that the illness he contracted was from a bite. It was unnatural and several of his pack members had been severely ill for some time. After that Maka's parents passed as their bodies had succumbed to the disease. As Maka stood there shocked the mightyena that was brought to the pack had taken command of it and gave Maka an ultimatum either join the undead or become their food. A hard decision, but Maka made a run for it. He was outmatched and outnumbered by his own kind. Since then he's been on the run while trying to stay alive. Little did he know his parents have become undead pokemon as well. Approved. The only note I will make is in the user notes regarding the name origin, "Native" is inappropriate and I worry about causing any undue issues with the use of the word. If you would substitute that that name meaning comes from the Lakota/Sioux language I would appreciate it. It is the only thing that really stood out among the admins.